During the last offseason, I gushed over Tim Lincecum and his incredible tools. Now that Lincecum has taken home the Cy Young award, I want to do my first rewrite of a player, to look at Lincecum’s evolution this year and how he went from an excellent pitcher to the best pitcher in the National League. First, though, a small correction to the previous article. Tim Lincecum’s fastball is actually a two-seamer, not a four-seam fastball. Despite being able to throw his fastball in the mid-90s and with a ton of vertical “rise,” Lincecum does not use four seams. Big thanks to Icon for this excellent picture showing Lincecum’s fastball. You have to look closely, but once you see the seams, it is easy to tell this is a two-seamer. For more on fastball grips check this site. Really, whether it is a four-seamer or two-seamer doesn’t matter because of the excellent action of the pitch. Here is a look at the movement of Lincecum’s pitches. Lincecum’s fastball averages 95 mph, which is overpowering, but he combines that with 11 inches of vertical movement and only three inches of horizontal movement. The small horizontal movement is because Lincecum throws his fastball from almost completely over the top. Because his fastball has little horizontal movement, it is effective against both right- and left-handed batters. Pitchers who throw more sidearm generally specialize in similarly handed batters. The overpowering speed is great, but the movement of the pitch makes it so much better. 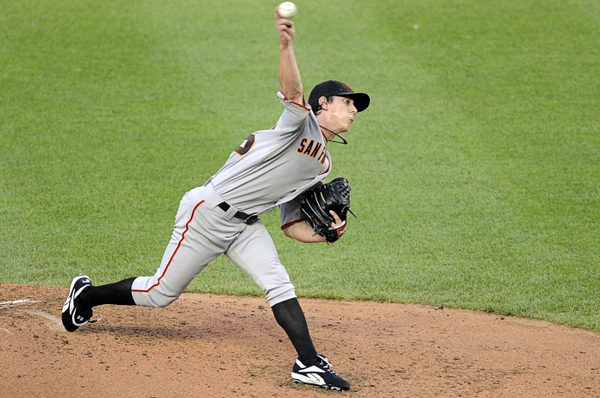 For off-speed pitches, Lincecum throws a change-up, slider and curveball. While the change-up and curveball were holdovers from last year, Lincecum added a slider this year—about two sliders in 100 pitches. Lincecum had thrown a slider in college, but it was scrapped when he was drafted. You can see why Lincecum didn’t use his slider often—it has almost no horizontal movement, which is important. Lincecum’s curveball is a very hard one, averaging 80 mph, similar to Ben Sheets‘. Also like Sheets, he gets good vertical drop, and that combination is absolutely deadly. Here is a look at Lincecum’s average fastball and curve from the side. Because of its speed, Lincecum can hide his curve extremely well. His curveball’s hump is absolutely tiny and he is letting it go from exactly the same release point. That gives a hitter no clue that the pitch is coming. But fooling hitters is only part of the equation. You then have to have the pitch drop enough so the hitter is swinging over the curve. That is where the vertical movement comes in; you can see the result with the huge differential when the pitch reaches home plate. That combination is what makes the pitch so effective. As good as Lincecum’s curve is, I don’t feel it is his best off-speed pitch. That pitch is his change-up, which has identical horizontal movement to his fastball with about half a foot less vertical “rise.” In addition, Lincecum has an excellent speed differential of almost 11 mph. That is extremely strong. When you look at his change-up and fastball, you see an even more devastating combination than his curveball/fastball. There isn’t any way for a hitter to identify the change-up here until the ball is right on top of him. If his change-up had different horizontal movement than his fastball, hitters could use that, but again, Lincecum’s change-up has identical horizontal movement. This is one of the best change-ups in the world right now and you hear almost nothing about it. The scary thing is Lincecum just started throwing this pitch when he signed with the Giants. Whoever taught Lincecum his change in the Giants organization deserves a huge raise. While Lincecum’s pitches are electric, plenty of pitchers have electric stuff. What made Lincecum the best pitcher in the National League this year was how he used those pitches. Last year, he used his curve a little more than his change-up and used it mostly as his strikeout pitch. This year, Lincecum used his change-up more often and with two strikes much more frequently. As I mentioned last week while writing about Brett Myers, breaking pitches that move away from the hitter tend to be more effective than breaking pitches that move toward the hitter. For a right-handed pitcher, this means more change-ups to left-handed batters and more curveballs to right-handed batters. Lincecum absolutely followed that pattern this year. Notice that Lincecum still throws some curves to left-handed batters and some change-ups to right-handed batters. He can get away with that more than other pitchers because he throws over the top and his change-up and curve have less horizontal movement. Pitchers like Myers who have more horizontal movement with breaking pitches need to be more careful about this. This means that right-handed batters can’t just forget about Lincecum’s change-up and focus on his fastball and curveball. Just another thing for hitters to worry about when facing Lincecum. I hope this article has convinced you that Tim Lincecum is far more than just his 95 mph fastball. While speed is great, Lincecum’s movement on his pitches is also excellent. Lincecum’s off-speed pitches mesh incredibly well with his fastball and this year he threw the right pitch for the situation time and time again. Not only is Lincecum blessed with great stuff, but clearly knows how to pitch and that is a deadly combination. Expect him to be one of the best pitchers in the league for many years to come.